At Broad Meadow Brook Nature Day Camp in Worcester, campers ages 4.5 to 16 tap into their natural curiosity and learn through hands-on outdoor exploration! Campers investigate different habitats, ecosystems, and wildlife species at our 430-acre wildlife sanctuary. Most of our day is spent outside, exploring our surroundings and getting dirty. Camp fun includes interactive play, noncompetitive games, songs, stories, and more. Early-Bird Discount! 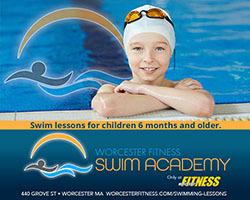 Register by March 15 and receive $15 off a one-week session and/or $25 off a two-week session. Register by mail or in person: Print and complete the registration form included in the brochure on our website, and mail or bring it with payment to: Broad Meadow Brook Wildlife Sanctuary, 414 Massasoit Road, Worcester, MA 01604. Experience the wonder of nature at Broad Meadow Brook! Explore animal adaptations, climate change, sustainability, and birding. Discover different habitats and wildlife around the sanctuary, play games, make crafts, and more! Explore the nature of Broad Meadow Brook and beyond in depth during a two-week session. Counselors will guide campers through a series of experiences during the first week. During the second week, campers will have an opportunity to help craft the experiences that they do together. Experiences may include animal adaptations, trees, insects, beavers, and water. Discoverers hike to Broad Meadow Brook’s Enchanted Forest Trail, Adventurers venture farther afield to Lookout Rock, and Explorers canoe off-site in the Blackstone River Watershed. Travel to different Mass Audubon wildlife sanctuaries to explore and learn about different habitats and ecosystems, including rivers, mountains, and meadows. Practice team building, go hiking and birding, learn animal identification techniques, and more. We will travel to field trip destinations in a Mass Audubon van. Learn what it takes to be a camp counselor! Gain leadership skills, hands-on training, and develop a lesson plan. All CITs present a lesson during one of their weeks at camp. First-year CITs will attend a five-day training session from June 24 to June 28 and choose two weeks to help lead camp sessions. CITs who have previously completed training may choose three weeks of camp to lead sessions. An application is required. Please contact the Camp Director by email or at 508-753-6087 x5013 to request an application. Next PostRegistration now open for Wachusett Meadow Summer Camp in Princeton!